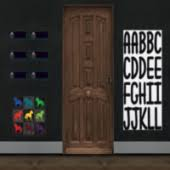 8bGames - 8b Grandmother Escape is another point and click escape game developed by 8b Games. Imagine that you went to your grandmother's house on a weekend to meet her. When you entered your grand mother’s house, you noticed your grandmother trapped in her room. Find some hidden objects and clues to solve some interesting puzzles to free your grandmother. Good luck and have fun!